Well, we may not have figured out an exact match for our wall texture, but we got close enough for now. Not suprisingly the desire for aesthetic harmony on one hand was balanced on the other by our desire to not sleep in the basement all winter. And now after three nights of primer, top coat, and spot filling, things are looking more finished than unfinished. Now that we've removed the tape, we're seeing all the places where the previous owners tape job or care in painting failed, and so when tonights largescale touch ups are dry tomortow, we'll be going back to do small scale finish work where the old wall color shows through at the cornerd and in many places spills onto the trim. Not something you really notice until its interloping as a third color where there should only be two. I seem to do this every year. I look back and remember the other stuff I was going to post here but never did. I know I had some pictures of our garden adventures to share, and I'll see if I can find some documentation of the SolsticeSalsa project too. But other than that, the rest of 2012 didn't hold a lot of house projects. The roof and chimney pretty much did us solid for the year. Also, this was HausFrau's first summer as a motorbike owner, so there was plenty of two wheeled adventures to be had, in addition to the gardening and camping and bunny wrangling and yard work, and all the rest of it. We are finally getting motivated again though, and this time it is to finally make our bedroom into a more peaceful and enjoyable hangout. We have to start with some fundamentals first. 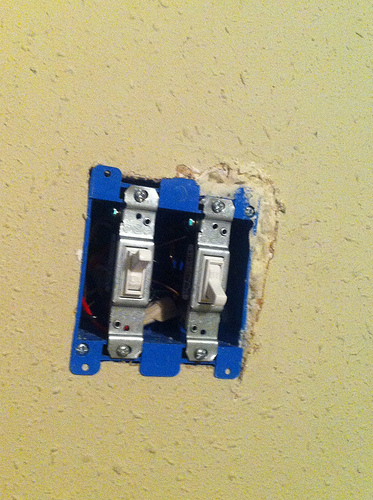 This is another room where the outlets are obnoxiously placed at about 4.5', above the firebreak in the walls. So we needed to move that down to a normal height. I've also always wanted an outlet near the head of our bed. And while we're at it, we'd like to put a sconce on the wall receptacle over the head of our bed, but not have it be tied to the ceiling fan switch anymore. Enter: Queen Anne Electric. These guys are fish-tape MASTERS, and were able to get us an entirely new modern circuit in the room, supplying two new boxes, two old boxes, and controlled by a new two gang switch, all from our master panel in the basement (that has a drywalled ceiling) and they only cut one access hole for the entire job. Not bad at all. In fact their only less than perfect move was a little over extended hole around our switch box. But a little expanding foam filled that up, and then some mud and a switch-plate will take care of the rest. I'm just thrilled to have two lights in there now. Next came the biggest amount of work for us. A large section of the plaster on the east wall has become more and more delaminated from the lathe in the years we've been here. 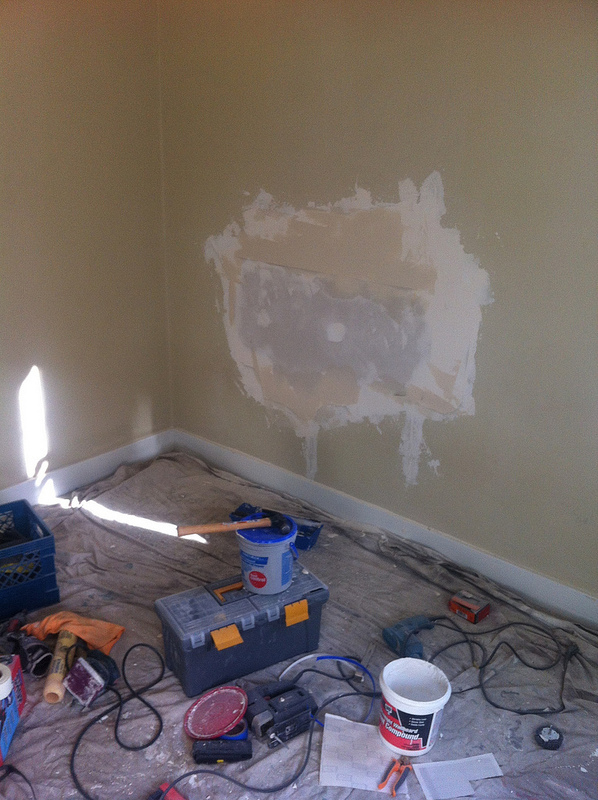 There are signs of some cheap mud patches, which are all cracking away as the weight of the plaster hanging loose increases. 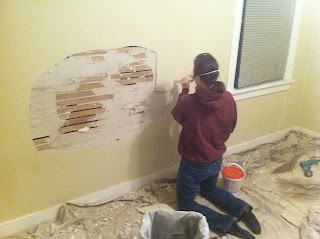 So began the always harrowing task of hacking away at your wall with a hammer. There were also several other hairline cracks around the room, several beneath the windows, and a fairly sizable one near the ceiling (that was the first symptom and motivation behind getting the new roof last season) ; those all got sanded out to solid material, and mudded back over. 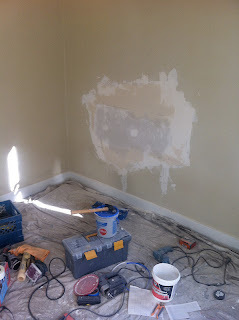 and start the post drywall clean up and prep for taping and paint. The only big remaining hurdle before that is trying to figure out how to texture the patched area. We got some spray texture, but none of the common offerings I've seen at the hardware stores look like a match for our existing texture. Neither does the silica sand additives you can mix into your paint. I'm not really sure what we're going to do about that. . . but we might just go with an orange peel style, try to spread it out a bit to match ours a little, and then . . . ignore it. I'd like to make it as good as I can, as long as we're putting in the effort . . but so far we're not finding any good other options. I'm trying to call in some pinch hitters for ideas . . we'll see how that goes. Either way, I'm getting very excited to get some new color in there, some nicer lighting, and get some art on the walls. We've waited long enough for a cozy place to lounge on lazy saturday mornings.